Victoria Bowling Club » Kirsten new cap in Blackjacks for Six Nations! Congrats Nic and Bradley! Kirsten new cap in Blackjacks for Six Nations! Congrats Nic and Bradley! You are here: Home » Blog » Competitions » Kirsten new cap in Blackjacks for Six Nations! Congrats Nic and Bradley! Kirsten Griffin is the only new cap in the Blackjacks bowls squad for the Trans-Tasman and Six Nations series in Christchurch in March. The 24-year-old, who won her first national title in Christchurch last Friday as a member of the champion fours team, has clinched selection after not initially being part of the Blackjacks extended squad. 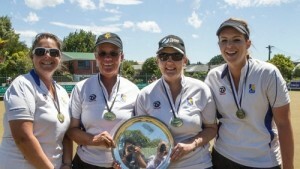 Griffin played her early bowls in Wellington at the Victoria club and won centre titles with her mother, Leigh Griffin, the 2015 national singles champion, who was also a member of the 2016 fours gold medal team. The Griffins lost last week’s national pairs finals to Christchurch sisters and current Blackjacks Mandy and Angela Boyd, who they teamed up with to win the fours title. After moving to Nelson two years ago, Griffin joined Commonwealth Games champion Jo Edwards’ United club. She will join Edwards, former United bowler Val Smith and the Boyd sisters in the New Zealand squad for the Trans Tasman series and the Six Nations tournament featuring visiting teams from Australia, South Africa, Malaysia, Wales and Scotland. And the Trans Tasman Development squad includes Bradley Down and Nicole Toomey to play against Australia also in Christchurch in March.